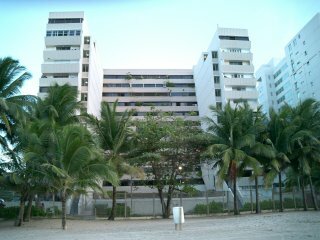 This 5th floor oceanside condominium apartment is located in San Juan's Isla Verde district. Its location offers ideal access to local restaurants and casinos. It is just a short walking distance from the Intercontinental and El San Juan Hotels. The apartment is tastefully decorated and furnished throughout with all amenities. It includes cable TV, air conditioning throughout, telephone, swimming pool, weight room, gym, playground, secure parking and private balcony. A spacious swimming pool is a neat feature of this condominium offering a marvelous opportunity for that perfect Caribbean suntan you've been craving for. A 2 bedroom, 1 bath apartment with fully equipped kitchen, Air conditioning, Cable TV, 1 Queen size bed in the Master Bedroom, 2 twin size beds in Guest Bedroom. All bed and bath linens, ocean view, Swimming pool, *weight room, *gym, playground, quiet neighborhood, located in the popular Isla Verde district of San Juan, Puerto Rico. Rates are subject to change without notice. " 1 wk min." 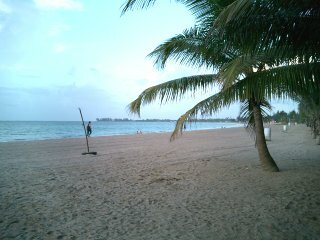 This caribbean vacation rental apartment is located near Isla Verde Beach. The beach is a very popular white and golden sandy beach suitable for sun bathing, swimming, wind surfing, and other water activities. It is just a short distance away from the Ritz Carlton Rest., and only 5 minutes from the airport.